Schools around the KC area are out, and the pools are open! 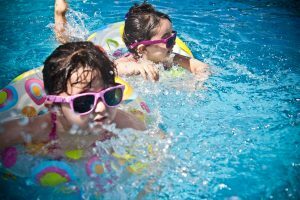 With temperatures nearing 100 already this summer, there’s no better way for a Kansas City family to stay cool this summer than to take advantage of the many wonderful water parks in the area. Oceans of Fun, Kansas City, Mo. : The biggest and best park around with 235 acres of wet, cool fun. It opened in 1982 and, at that time, was the largest water park in the world! It’s still a great place for a Kansas City family to spend the entire day. Oceans of Fun is a tropically themed water park that has something for everyone, including rides, water slides, lazy river, wave pool and toddler area. The Springs Aquatic Center, Northland: With close to a million gallons of water, The Springs is a fun summer hot spot for Kansas City families. Lounge by the leisure pools, race in the competition pools, dive, slide or splish and splash in the spray ground. The lazy river and tall slides (for the bigger kids) also are popular ways to stay cool here. The Bay Water Park, South Kansas City: This city-owned park is great for teens. It’s the only place in KC where you can surf! Features include the surf simulator, lazy river and an aquatic playground. Mission Family Aquatic Center, Mission, KS: Nestled in a neighborhood area, this water park is on the smaller side but is great for a Kansas City family with young children. Features include an ADA-accessible pool, slides, playground, wave pool and splash pad. Thomas A. Soetaert Aquatic Center, Shawnee, KS: This park has something for everyone in your family, including a competition pool, diving boards, two 125-foot body slides, a lazy river, vortex, bubble bench and interactive aquatic features. Parents of younger kids will love the fully enclosed baby pool area with a water playground. Whether you want to splish and splash in a small water park, or ride the waves in a bigger facility, Kansas City has tons of wet and wonderful water options when the temperature takes a turn for the steamy! So pack up the family this weekend and spend the day getting wet at one of these fun water parks in KC. Several KC water parks are close to family-friendly areas and neighborhoods. If you are a Kansas City family looking for a new home in the KC area, call us and let us provide any information you may need about the best places to live in the KC metro. We are Team RE, and we’re ready to help you buy the perfect home for your family. We can help you sell, too! Just call 913.451.5711 or visit www.teamre.com. Happy summer from your real estate professionals at Team RE!